When the Shelburne Falls and Colrain Street Railway ceased operation in the 1920s, the five-arch concrete span it used to cross the Deerfield River remained, and was crumbling into disrepair. Howerver, a group of forward-thinking women in town proposed planting flowers on the bridge to keep it from becoming an eyesore. Eventually maintenance of the bridge passed to The Shelburne Falls Women’s Club, a subcommittee of which oversees it to this day. Today, nearly ninety years hence, the Bridge of Flowers is maintained by a full-time botanical gardner and team of volunteers. Both the span itself and both approaches offer and ever-changing displacy of flowering trees, shrubs, perennials, vines, bulbs and annuals, blooming from April 1 to October 30. Tens of thousands of visitors from almost every country on Earth have logged their appreciation in one or the other guestbooks on either side of the bridge. The Bridge of Flowers is a pedestrian thoroughfare between the Buckland and Shelburne halves of the village. From the front steps of the Dancing Bear Guest House it can be reached by turning right and walking to the end of the block where you can turn right on Cross Street and procede, two short blocks to Water Street. Turn left and you'll find the entrance to the Bridge of Flowers on your right, just past Vävstuga Swedish Weaving School. The Shelburne Falls Trolley Museum is dedicated to preserving and operating Shelburne Falls & Colrain Street Railway trolley car No. 10. This car was built by Wason Manufacturing Co. in Springfield MA in 1896. It was delivered new to Shelburne Falls and has never left the valley. For thirty years it served its namesake towns. For twenty years it crossed the Deerfield River on what is now the famous Bridge of Flowers. Saved by a local farmer, it spent sixty-five years as a chicken coop, tool shed and play house. Now, through the efforts of the Shelburne Falls Trolley Museum, you can ride it in the same freight yard where it used to load and unload passengers, apples, mail, milk and other freight, one hundred years ago. In addition to car No. 10, visitors can operate a handcar, and see two streamline PCC cars from the early fifties (awaiting restoration), an early 20th c. passenger car, and a caboose, as well as numerous other items of railroading interest. The Shelburne Falls Trolley Museum is about a 10-minute walk from the Dancing Bear. Cross the Iron Bridge or the Bridge of Flowers (they both lead to the same place), and turn left. Follow Depot Street which is the middle fork of the three possible lefts turns after turning left after the bridge. The trolley is open on weekends and holidays, Memorial Day through Columbus Day. 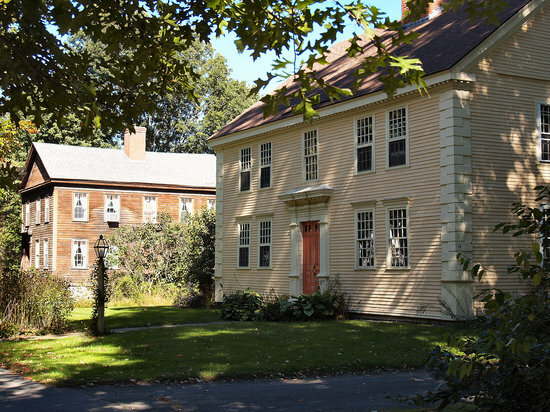 Historic Deerfield is an authentic 18th-century New England village within the town of Deerfield, about a twenty-minute drive from the Dancing Bear Guest House. This outdoor ethnographic museum is unique in that nearly all of the buildings are on their original foundations and not moved there from somewhere else. Several houses are available to tour, each containing original furnishings and artifacts. Visitors can see demonstrations of colonial-era trades and crafts and can explore Deerfield's world-famous collection of early American crafts, ceramics, furniture, textiles and metalwork. It’s a celebration of New England heritage. From Shelburne Falls, follow the Mohawk Trail (Route 2) nine miles east towards Greenfield. At the round-about, continue on Route 2A into the center of Downtown Greenfield. At the traffic light turn right on Routes 5 and 10, and travel south three miles. Look for right turn to "Historic Deerfield". The museum is open year round, and the house are open from mid-April through the end of December. The "Glacial Potholes" began to form after the last glacier age when the Deerfield River first started to flow over these rocks, about 14,000 years ago. The formation of these river-eroded features is thanks to the great glacial lake, Lake Hitchcock, that filled the Connecticut Valley and also extended into the lower Deerfield Valley. While Shelburne Falls was not under Lake Hitchcock, it was under the sediments of the Deerfield River that built a delta into the lake. When Lake Hitchcock drained, about 14,000 years ago, the Deerfield River was then able to cut downward into its delta sediments, exposing the gneiss bedrock which began the eroding process that continues to this day. The Glacial Potholes are located in the Deerfield River directly below Salmon Falls. They can best be viewed from the Shelburne side of the river at the foot of Deerfield Avenue, or from the Buckland side, just to the right of the Lamson and Goodnow Factory Outlet Store on South Street. This major tributary of the Deerfield River invites visitors to some excellent water-related recreation. In addition to swimming, tubing, canoeing and fishing, the Deerfield River has two sections of the river for whitewater rafting or kayaking: the Fife Brook section for class II and III paddlers, and the Dryway for class IV paddlers. In addition there are tributaries along the Deerfield with class III, IV, and V rapids. Several local river trip companies along the Deerfield offer organized rafting and kayaking trips: Zoar Outdoor and Crabapple are both within a short drive of Shelburne Falls. For directions and reservation please check out their webpages: http://www.zoaroutdoor.com and http://www.crabapplewhitewater.com. The Deerfield River is also an excellent trout fishery, prized for its oppportunities for fly fishing. Two sections between the Fife Brook dam and the Route 2 bridge are catch and release areas. There are 5 dams which control the majority of the river flow and allow selectible trout fishing through the year. Shelburne Falls is also an excellent base for great hiking along the Deerfield River. The Mahican-Mohawk Trail begins just one mile from the Dancing Bear Guest House and follows the Deerfield River downstream through forests and medows with several spots to enjoy the river.